The Ramon Magsaysay Award Foundation is inviting everyone to The 2009 Ramon Magsaysay Awardees' Lecture Series from August 27-September 2, 2009 at the Ramon Magsaysay Center. Free admission. "Tracking Environmental Exploitation and its Human Rights Impact"
Note: I have attended this riveting and eye-opening lecture based on the life story of Ka Hsaw Wa and his advocacy against human rights violation and on promoting peace in Burma. Very inspiring! 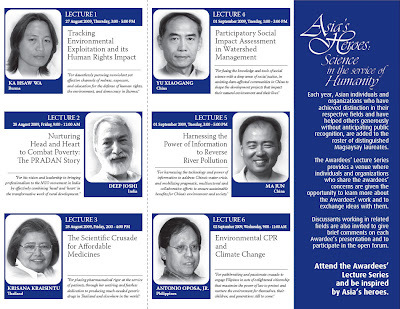 "Nurturing Hed and Heart to Combat Poverty: The PRADAN Story"
"The Scientific Crusade for Affordable Medicines"
"Participatory Social Impact Assessment in Watershed Management"
"Harnessing the Power of Information to Reverse River Pollution"
"Environmental CPR and Climate Change"
Ramon Magsaysay Center is located at 1680 Roxas Boulevard, Manila, Philippines. To register, please call: (632) 521-3166 to 85 local 138 or 139. Wow! I haven't been "in the know," I bet you'll cover this event too, right? Thanks for posting that pic! :) ok ba tong comment form? Mas gusto ko yung original sana na js-kit. Di ko masyado type tong Echo which was created by js-kit. Pinalitan nila e. Mas ok ba ang disqus?